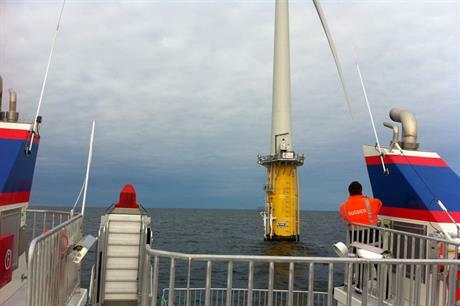 EUROPE: Maintenance access is part of the Offshore Wind Accelerator's project to cut the cost of offshore wind by 10%. The Carbon Trust's Breanne Gellatly tells Katie Daubney about the research programme, and how changes in regulations could help the offshore service industry. Operations and maintenance (O&M) represents about a quarter of the cost of energy for offshore wind. This high share results from the cost of accessing and maintaining the turbines, as well as the lost revenue when turbines are not operating. O&M is therefore a priority for cost reduction. The Carbon Trust's Offshore Wind Accelerator (OWA) research programme in the UK has set a target to cut the cost of offshore wind by at least 10% by 2015. This requires a better understanding of the vessels on the market and their suitability for each site — based on variables such as distance from shore, meteorological ocean conditions and port location — to enable offshore wind-farm operators to select the best strategy for their site. Today, each turbine in UK waters typically requires around six visits per year - one planned and five unplanned. Reducing the number of unplanned visits would cut costs, even if it meant increasing the number of planned visits. For the UK industry, with 436 turbines installed in UK waters at the end of 2011, each requiring six visits per year, this meant that every day, seven turbines required a visit. For Round Three, the latest and largest round of offshore wind licensing, there will be more than 5,000 turbines in UK waters. Even if you reduce annual visits to three or four, more than 40 turbines would need to be serviced every day. Conditions will be tougher, turbines will be further offshore in rougher seas, and foundation designs will vary. To manage these situations, safer, more robust access systems are required. Personnel transfers are currently made in relatively calm seas of up to 1.5-metre significant wave height (Hs) - the wave height, from trough to crest, of the highest third of the waves — using a port-based strategy, for turbines supported with monopiles. The vessel pulls into the boat landing, and technicians step across on to the turbine ladder. With future offshore projects on average 65 kilometres offshore from the UK, this will not be viable. While the first round of offshore projects averaged 8 kilometres from shore, Dogger Bank, which is due to go online in 2019 is 125 kilometres from shore. Weather conditions also play a big role. Data gathered by the Carbon Trust shows that based on current access systems, far-shore sites would only be safe for crews to access for 200 days of the year. If transfer conditions could be raised from the current Hs of 1.5 metres to 3 metres, this could increase to 310 days. As a result, the OWA Access Competition was launched, in 2010, to find more suitable O&M access solutions. The Carbon Trust continues to monitor the market and provide funding to companies with suitable innovations. The OWA Access Competition has helped find viable solutions for Round 3. Current methods of assessing access systems are limited, and industry typically relies on significant wave height at the location. This approach does not consider factors such as wave direction and wave period. Other issues that should be taken into account are speed, capacity, comfort, safety, fuel economy and charter costs. OWA, with energy and sustainability consultancy DNV Kema, has developed a set of sea-trial procedures that creates performance data to compare different access and transfer systems, scoring them in a variety of sea states to produce a "pass" or "fail" under particular conditions. These results will build a picture of where the vessel or transfer system performs best. Systems will be measured on: transit from port or mothership to turbine, approach to turbine, and transfer from vessel to turbine. Maintained speed, safety, capacity, fuel economy and operating cost will also be recorded, as these come into play when considering a system's suitability and cost for a specific location. Adoption of these metrics will allow more parameters to be modelled, enabling operators to make more informed choices on which system is appropriate for a specific location. OWA acknowledges that innovative technology alone cannot do enough to improve access. Changes to regulations would be a great help. Paul Wilkins, head of vessels policy at the Maritime and Coastguard Agency (MCA), admits that the agency is having to play catch up with the evolving offshore wind industry. It is working on a series of initiatives, such as revising craft and vessel codes to reflect the type of work being carried out to maintain offshore wind turbines. Currently there is no harmonised international code or regulation specifically for wind-farm service vessels. Technicians carrying out offshore maintenance are classed as passengers, which introduces burdensome safety legislation and decreases operational flexibility. The International Maritime Contractors Association (IMCA) and the National Workboat Association are currently reviewing training and qualifications for workers on offshore-wind service vessels. The OWA continues to search for solutions to operating in the harsh conditions in which O&M strategies must work to service the newest generation of offshore projects. It works closely with the supply chain throughout the process to make sure the most promising concepts are developed, derisked and commercialised. 1 The TranSPAR is a small self-propelled vessel that sits 3 metres above the water on a vertical strut that extends below the water to a submerged heavy-hulled propeller, producing a small but stable vessel. 2 The Fjellstrand WindServer’s innovative hull design allows very fuel-efficient travel while being very stable when stationary, which is ideal for transferring engineers to turbines. 3 The Nauti-Craft’s a unique hydraulic suspension system allows the hulls to conform to the ocean’s surface while providing improved stability and safety of the deck for crew transfer. 4 The Pivoting Deck Vessel incorporates a deck into the vessel, which links with the turbine foundation and reduces motion significantly during transfers. 5 The Autobrow system positions a gangway, or "brow", on the foredeck that is computer-controlled up and down to compensate for the heave and pitch of the support vessel. 6 The Umoe Mandal Wave Craft uses an air-cushion, like a hovercraft, making it extremely fast so it can reach a turbine in a shorter weather window. When stationary, the air-cushion can be used to stabilise the vessel.